Of the many questionable things Lance said, this statement struck me as one that was actually true. I found myself wondering how many people could probably relate to it at some point in their careers (albeit, hopefully not regarding illegal activities). Culture is often held up as the culprit or the hero behind the way we behave at work. It can serve as an albatross, or as a performance-enhancing substance. Creating and maintaining an intentional culture is one of the most important responsibilities of being a leader, and doing so involves many different elements. Lance was leading a team within a broader culture he claims not to have created, yet he supported and promoted it by his decisions and actions. Are there places you are doing the same? 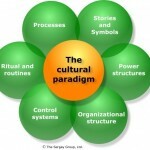 Culture is a combination of structure and unstructured components, and of tangible and intangible things. Standard, documented processes are part of a culture. So are the unspoken workarounds to those processes! Where it works for and against their overall goals. Where it is promoting or rewarding behaviors that have unintentional consequences. Here’s the thing: everyone has the ability – and the responsibility – to pay attention to these elements. This quote is attributed to different people, but its use always hearkens back to the same place: a paper originally published in the Academy of Management Journal in 1975 by Steven Kerr. Kerr drew attention to “the folly of rewarding A, while hoping for B.” Kerr found numerous examples across politics, academia, the military, private industry and so on where reward systems were out of balance. He found that many systems reward behaviors that the rewarder is actually trying to discourage, while failing to reward the behaviors desired. Logically, we understand the point of creating reward systems that are aligned with goals. And yet when I work with organizations to peel the onion, we often find root causes where the unspoken aspects of culture and the reward system trump strategic direction and desired behaviors. I remember working with one organization a few years ago where numerous members of a senior team realized they themselves were subconsciously behaving in ways that contradicted the very changes that they wanted to see in their organization. While they didn’t have the authority to change the reward system in a wholesale manner, there were many things they could do within their own spheres of influence. These conversations weren’t easy; introspection rarely is. And yet their level of empowerment rose significantly when they chose to be honest about this, as did the bonds of the team. Many people may feel there isn’t anything they can do to shift their organizational culture, or that it may rock the boat too much. Some of that is probably true. However, not being able to fully change it is not the same as sitting by idly and letting it go unchecked. Ask yourself: Which behaviors do I most appreciate? Which cause me the most frustration? Check in: what do you notice? Are there places where you find yourself exhibiting behaviors or supporting beliefs you disagree with, or that you believe are misaligned with your goals? Ask yourself: Which of these might I be able to influence or shift? I know this exercise might surface some aspects of your organization you may not wish to explore. My hope is that it reminds you of your ability to be responsible for what goes on around you.